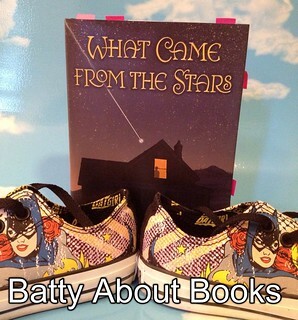 Batty About Books returns from a summer hiatus with a discussion of the first half of What Came From the Stars by Gary Schmidt. As before, my thoughts are in purple with Kathy (aka @thebrainlair) responding in blue. Her thoughts with my responses are hosted on The Brain Lair. Don't miss the discussion there either! Fair warning - here be spoilers! Feel free to jump in with your thoughts in the comments. That's what a community of readers does, right? My Batty About Books partner - Kathy (aka The Brain Lair) has happily jumped into a ton of science fiction to keep me happy over the past few months. When Kathy mentioned that she had a book she was dying to read, I was more than happy to come along for the ride. I have to admit that I haven’t read anything else by Schmidt, even though there is a lot of love for Okay For Now online. Imagine my delight when I went to buy the book and realized that the “came from the stars” part was literal! I stuck my nose in the book that very first night. Maria: Overall, so far, I love the book. Yet I wasn’t positive I would while reading the first chapter. So I’m going to start with my impressions of the first section. Kathy: The language threw me too. There were too many new characters and new words. I wonder if the words were too similar to each other? For me, I had a hard time distinguishing between who was fighting. With the Valorim, the faithless Valorim, the O’Mondim, the Ethelim and then all these levels of the palace, I was like AHHH! But, it started to come together. I found that glossary, I just wish it was in the front! Yes - in the front, or with some indication when the words started flying that there was a glossary. Kathy: I think the beauty is what kept me going in that first chapter. I could “feel” the words! The story begs to be read aloud, to see if it translates off the page. You mention the archaic style - that also could have tripped me up as I just recently finished The Power of Six. It’s low fantasy told in a contemporary fashion. It’s plot driven, like the Ethelim pieces seem to be, so the action scenes started to stick with me. Maria: There is evil, and evil cheats and steals and is out to trick even its allies. I really enjoyed all the double crossing, and I’m hoping that I get to keep chuckling over the way evil stabs each other in the back. You chuckled? When Taeglim and Yolim tricked Waeglim? (what’s with all the -im?) When Lord Mondus got rid of Calorim, Belim and Belalim? And when Verlim the Destroyer was destroyed? Oh, Maria - ye of hard heart. Oh yeah, I laughed. I love to see evil get its due. Maria: What really makes me love this book, though, is the half that occurs here on Earth. Tommy springs to life immediately. All his little foibles (like the way he reacts to the babyish lunch box) made him feel so real. Kathy: I loved when he was trying to hide the lunchbox! And his friends are so funny. The way they teased him about the lunch box. And James Sullivan with authentic Tom Brady-signed football. And Patrick Belknap and his accordion. And just how Schmidt uses first and last name to make them seem even more alive. You can picture each one as they sit down at lunch with Tommy! The first lunchbox scene - with his father - was what really sold me on the character. Kathy: PATTY! I like that Tommy and Patty don’t need to speak to communicate. He’s so in tune with her that he understands what she needs just by the way she holds her hands. I wonder if they were close before mom died or did Tommy’s perceived guilt draw him closer to Patty? Maria: Tommy’s family reminds me a little bit of Leslie’s family in Bridge to Terabithia. Tommy also reminds me of Jess. I love the father, and how Tommy’s family is so tied to the beauty of the sea. It makes me want to jump in a car and go visit Plymouth right NOW. I can hear the sea, and smell it, in this book. Kathy: Nice text-to-text connections with Bridge and Wrinkle in Time. I felt more like Tommy was Leslie or Meg (which I thought you mentioned but now I can ‘t find ) Leslie because he seems freer of spirit than Jess. Jess needed Leslie to come along and make him alive while Tommy seems to be the center here. Like the other children look to him. He reminds of Meg in that he’s so sensitive and he also doesn’t see the effect he has on others. Did you say Patty was Charles Wallace? Absolutely - I saw the Jess connection because of the drawing, but he has Leslie’s soul. I wonder how much of that was hiding inside him before the necklace, and how much he was already showing. And yes, Patty’s refusal to speak reminded me of CW, though Charles does talk to family. The Plymouth setting is done exceptionally well. I would say it would be “distinguished” in Newbery speak. It is solid part of the story and one you can certainly experience! Maria: The power of ART intrigues me, too. I love how Tommy is able to take on the Art of the Valorim, and that it involves so many types of artistic endeavor. Drawing, painting, cake cutting, music... I can’t wait to see what comes next. Kathy: The cake cutting was brilliant. All the kids wanting him to cut their piece and how the teacher was stunned. I also loved when he repainted the “rucca” work of the principal. The goat was eating! That was thrimble. I wonder if when he returns the necklace (if he returns it) will he lose the power of ART? Or, since his dad is, and his mom was, talented, will he find the ART they’d passed down to him? Does that make sense? Completely makes sense. I wonder if he’ll have to choose the Art that fits him best, once he doesn’t have the necklace any longer. Can one boy contain that many types of gifts without the power of the chain? Maria: Okay, so I guess what I love most about it is the language. The beauty and simple lyricism of Tommy’s sections contrasted with the high fantasy style of the other world. Kathy: Agreed. I wonder if that will be a downfall? Will students connect with it? Will they think it’s too wordy or flowery? I worry about the same thing. This may be a book that doesn’t “hit” with every fantasy reader. I’m curious about how it will fly with my students. They are major fantasy readers, so that should give them a leg up on the style. Maria: Did I mention there is a glossary? Even if you don’t feel like you need it, you should check it out. It was written with a real tongue in cheek style and I laughed through the whole thing. Kathy: Ha! I knew there wa a glossary, but like I mentioned, too lazy to look in the back of the book! But I will before I continue on! Do! It’s so much more than just a regular glossary. It’s a part of the tale. There you have it, my friends - a glorious return to Batty About Books! If you can, grab the book and read it. Join in on our discussion today and next week.